Worldwide, bakers are taking inspiration from the alluring new flavours they encounter on their travels. 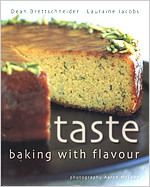 In Taste - Baking with Flavour, award-winning authors Dean Brettschneider and Lauraine Jacobs offer more than 50 recipes. Clearly set out, featuring 'Keys to Success' and Aaron McLean's outstanding photographs, this exciting new collection is for serious bakers and novice cooks alike. From Chocolate Pistachio Madeleines to Lemon and Blueberry Polenta Cake, from Korean Corn Bread to Red Onion Fougasse, Taste will tantalise and inspire you. While the focus is on just that, the authors don't neglect the basics. They describe how best to make the building blocks of baking - such as puff pastry, sponge cake and even a natural sourdough mix using yeasts absorbed from the air around us. They show how the traditional techniques of artisan bakers can be combined with good ingredients to produce a superb and stylish meal. Winner of the Best Desserts Book, English – Rest of the World, and finalist for The Best in the World, the Gourmand World Cookbook Awards, 2005. Winner of a Golden Ladle for the Best Soft Cover Recipe Book (RRP under US$25) award at the World Food Media Awards, 2005. Stephanie Alexander, author of culinary classic The Cook's Companion. Dan Lepard, world-renowned author of Baking with Passion and The Handmade Loaf. "The bread-making section includes some excellent notes on New Zealand flours. The huge variety of recipes ensures there is a bread or cake for every level of competence and to tempt every palate. Incredibly good value." Dean Brettschneider is a professional baker and patissier with an international following. Known internationally as "the Global Baker", Dean is a professional bakery adviser, widely respected as a skilled and innovative craftsman. Working in Asia, the USA, Britain and Europe as well as in New Zealand, Dean has earned many accolades and awards in bakery competitions and exhibitions.